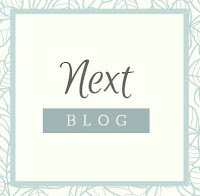 Tonight I have the pleasure of participating in a really special blog hop. 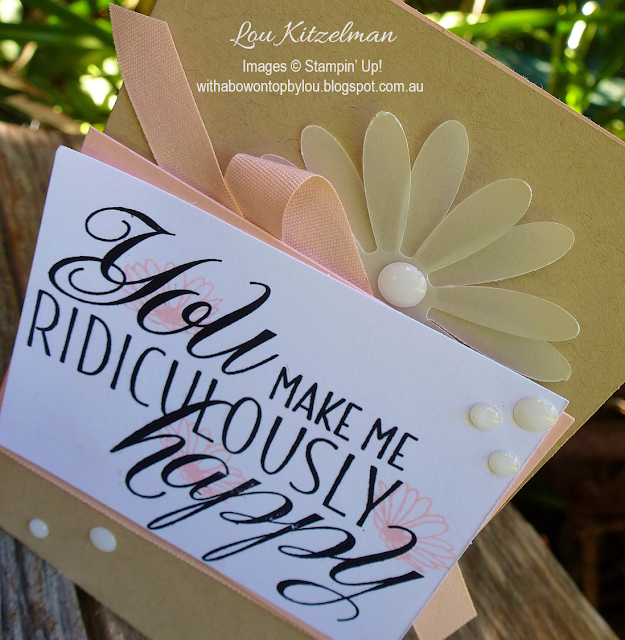 It is to celebrate the 'stampinversary' of one of my really dear stamping friends Kelly Kent. She is celebrating 5 years of being a Stampin' Up! 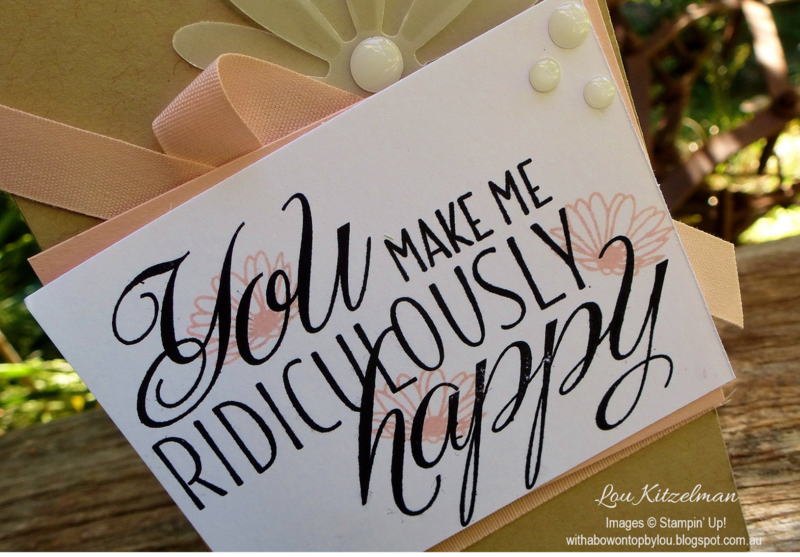 Demonstrator and asked some of her stamping friends from all over the world to celebrate with her in a blog hop where the theme is 'All things happy'. Kelly had so many keen friends that she had to stage 2 hops - a real testament to what a fabulous, generous and just all round lovely friend that she is to many. Whether you are starting with me or have hopped over from visiting Rachael Lewsley, you are in for a real treat. 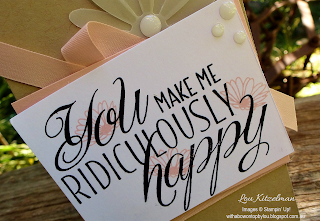 Celebrating with Kelly tonight are some of my stamping idols (certainly made it a bit nerve-wracking when creating my card!) so you won't want to miss a single one. When I was thinking of something to make, I got to thinking about what makes me happy. There are lots of things but right up there is simply creating something and being able to escape the world for even a short time. Combine that with using some beautiful new products (that you can order from tomorrow - yay) and a nifty card fold and well ...... that certainly puts me in my happy place! 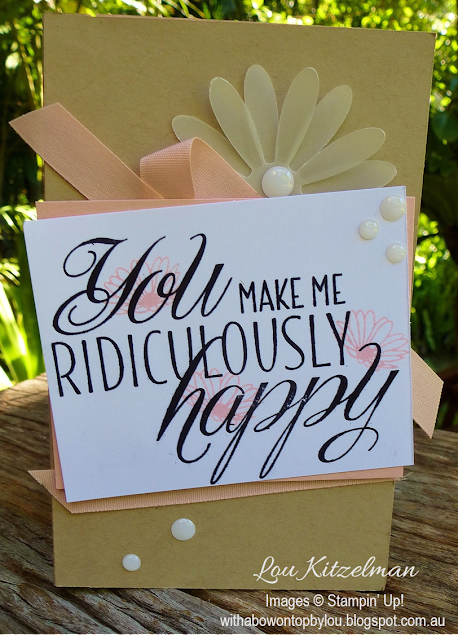 How perfect is this sentiment from the Lovely Friends stamp set? I just started stamping and grabbing things from my box of new goodies and it all evolved from there. A vellum punched daisy (love that new daisy punch), some Powder Pink cardstock and coordinating ribbon and some stamped daisies to enhance the sentiment and I was a happy girl. On Monday I taught the lovely girls in my class how to make Surprise Diorama Cards and thought it would be the perfect fold for this hop. You can find out how to make it here. It is a great fold - super easy but has a bit of a wow factor. Plus it folds flat to fit into a standard envelope. I love the depth you get with the shallow box inside. The Lovely Friends stamp set has gorgeous font, lots of sentiments and little details to add like these brackets/frames. Love it! 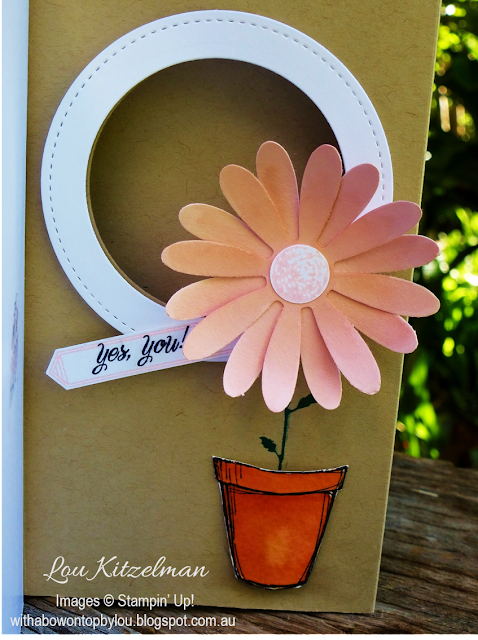 I had a left over watercoloured pot from a card I had posted earlier in the week and knew I could plant a Powder Pink gerbera in it. I used an Aqua Painter and ink from the lid of the ink pad to add a bit of definition to each petal. 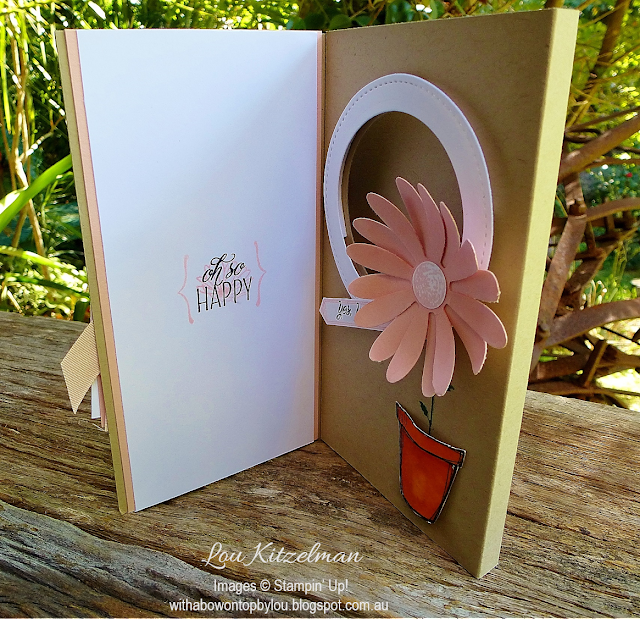 Gerberas, stamping and good friends - what more do you need to be happy? I am so happy to be celebrating this milestone with Kelly. Stampin' Up! is more than just beautiful products. 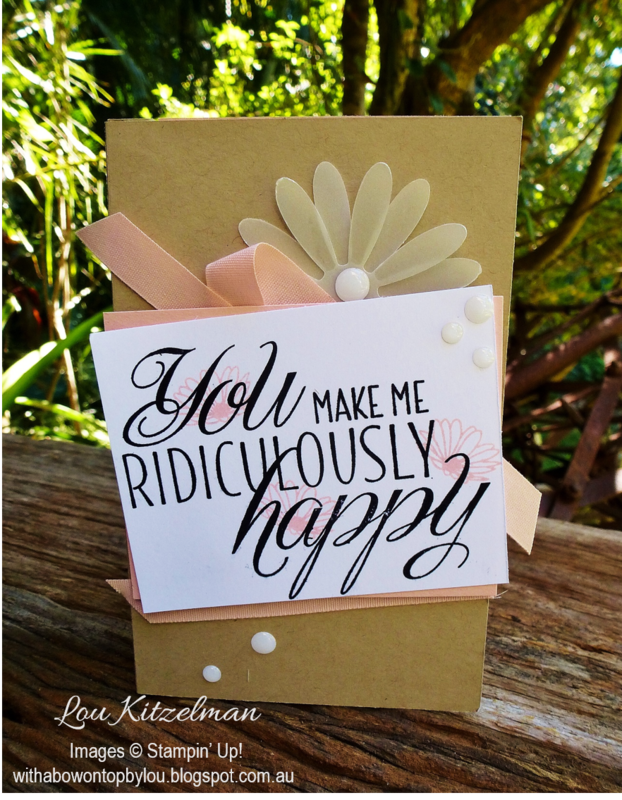 For me the best thing about Stampin' Up! is being a demonstrator and the networks and friendships that I have been able to make since I became one 4 years ago. It is one of the best things I have ever done and treasure all the friendships I have made and all the fun, support and inspiration that comes with it. Make sure you hop around to each of Kelly's Stamping Friends. I can't wait to see what they have in store. Next up is the super talented Courtenay Heuston.